Recently, I was going through my Pinterest page and looking to see where I fell short on recipe ideas. That made me sad, because spiralizing is such a unique way to add vegetables (and flavor!) to the most important meal of the day: breakfast! Sorry to deprive you of breakfast recipes! Today, we change that with this Paleo eggs benny. The hollandaise sauce is made with coconut oil instead of butter and with a smidgen of chipotle flavor. Finally, as I mentioned yesterday, there’s a poached egg. Feel free to fry it up, sunny side it up, or over easy it up – whatever your preference, you’re the one eating it! Making this recipe Inspiralized me to take time with my breakfasts each morning. I guess I should add that to my list of New Year’s resolutions. An hour or two later, I usually make my beloved green smoothie, which fuels and nourishes me for my morning. However, since I do work from home, I do have the luxury of taking some extra time on breakfast. I always tell myself that my time is better spent working, but cooking is therapeutic for me and I always come up with my best ideas while cooking! 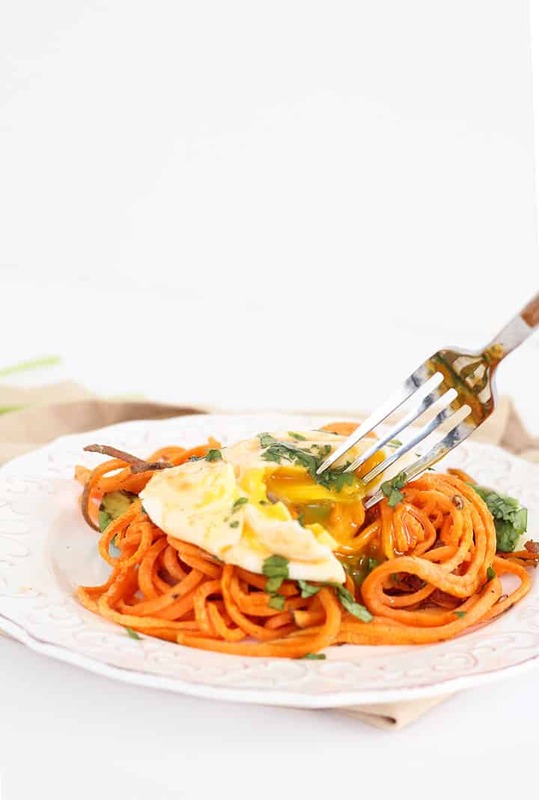 So, cheers to making more spiralized breakfast recipes! And cheers to positive life goals, resolutions, affirmations and outlooks! 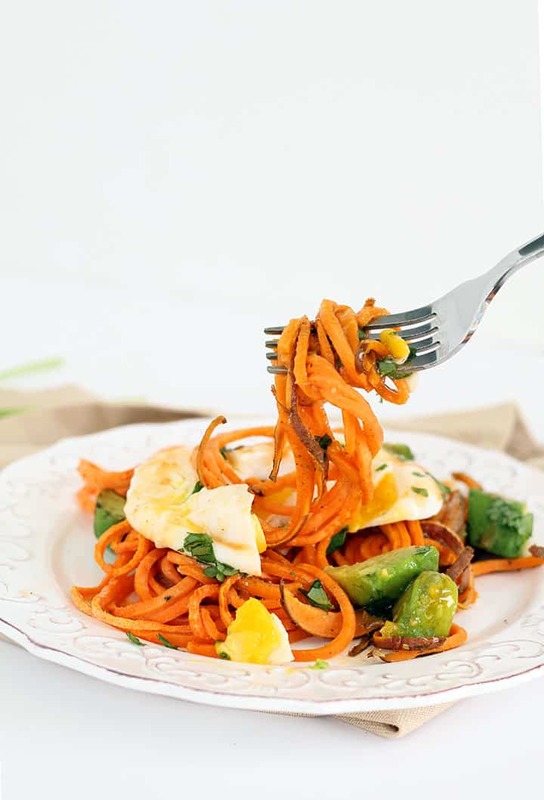 How do you incorporate spiralized vegetables into your breakfast? Preheat the oven to 425 degrees. Place the sweet potato noodles on a baking sheet, lightly coat with cooking spray and season with garlic powder, salt and pepper. Sprinkle over with the avocado cubes and then roast for 10-13 minutes or until the sweet potato noodles are cooked to your preference. Meanwhile, place the egg yolks, lemon juice, se salt, chipotle pepper and sauce in a blender and blend for about 10 seconds. Then, set the blender on medium and slowly pour in the coconut oil to thicken. Once thickened, set aside. After the hollandaise sauce is made, fill a medium saucepan halfway with water and bring to a steady simmer. Crack the eggs individually into a ramekin or small bowl. Then, create a gentle whirpool in the simmering water to help the egg white wrap around the yolk. Slowly tip the egg into the water. Let cook for three minutes. Remove with a slotted spoon and gently rest on a paper towel lined plate. 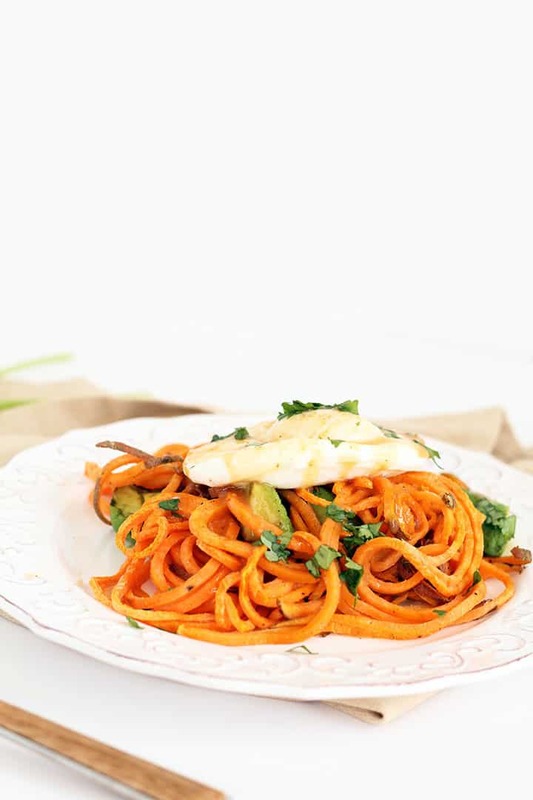 Once the sweet potato noodles and avocado are done, place like a “nest” on three plates. Top each with poached (or fried, if you don’t feel like poaching!) egg and drizzle with hollandaise sauce. Serve immediately, garnished with cilantro. I didn't get past the beloved green smoothie. I am new here. Would like to know what's in that. Sounds good. Coming next Thursday, I'm sharing my protein shake! This looks delicious. I got a spiraliser for christmas and can't wait to try it out. Need a big veg shop!! Yes! I definitely buy loads of veggies - it's gratifying to look in your shopping cart! Do you cook the sauce? Or serve it over everything with raw egg yolks? The lemon juice and heated coconut oil help cook the eggs in the sauce - just follow the recipe! The secrets to a perfectly poached egg are fresh eggs (which simply poach better) and a fine mesh strainer. The white has 2 main proteins, one of which doesn't firm up well and creates the ugly wispy strands. Crack your egg into a fine mesh strainer and the watery part of the white will drain through with some gently swirling. You are left with a lovely egg that will poach beautifully without salt, vinegar, vortex, etc. (none of which really work). Ref. Harold McGee's "The Curious Cook." So happy with this, thank you! If you don't have coconot oil, what can you use as a substitute while keeping this low calorie? Thank you. Can't wait to make this!! As to how I incorporate spiralized veggies in to breakfast; I've spriralized and riced rutabaga before to make sort of a hash. It's excellent and you'll never want regular hash browns again!! Hi Hi. Do you heat up your hard veg (sweet potato or rutabaga) before spriralizing!? I'm nervous it will break the machine! Nope! I spiralized it raw! This looks phenomenal! I LOVE eggs benedict, so this I will definitely try! How does one serving of this breakfast get to 117% of daily cholesterol? My understanding is that only animal products have cholesterol. So, per serving, it would be only 1 egg plus 2/3 of an egg yolk that gives you all that cholesterol? Is that right? Egg yolks are high in cholesterol, unfortunately! I was Inspiralized to finally get those sweet potatoes off the counter, and in my belly! Breakfast for dinner, but I made mine with what was on hand, crispy fried bacon, egg, green onion, and shredded asiago/edamer cheese to make a sauce. Six thumbs up! Sounds delicious - and creative!! This sounds delicious!! Can't wait to try it, for dinner! Happy New Year Ali, hope it's your best ever! I am soooo looking forward to your cookbook! When is the release date, was it March? Thank you so much - yes, March! Looks really yummy! I wonder how it would work with those spiralized hamburger bun thingies you did a while back (as more of an English muffin shaped muffin ;-) )? I've been wanting to try those but haven't gotten around to it. I love your recipes, love my new spiralizer. Thanks for all the inspiration! I like to use any "leftover" spiralized veg for a frittata . Easy, tasty and a wide variety of favors. Usually warm slightly and then add beaten eggs, seasons, and ....some shredded cheese if so inclined! Your post looks delish, and I look forward to trying! Oh wow, this looks delicious! I have a rare Saturday off, and I know what I'm making my husband for breakfast! This looks sooooo good! Unfortunately, I'm usually cooking for one or maybe two at a time - do you think the sauce would keep well refrigerated and warmed up a day or two later? Not very much so, but just divide everything by two! most of your sweet potato recipes call for peeling. my husband was cooking, was not going to peel since it wasn't stated in the menu and we had a "loving" exchange about it. was the non peeling on purpose? why just this recipe? Just for added texture and to absorb the sauce a bit better! I prefer peeled, especially with pasta dishes, but others like with this breakfast idea, the skin won't affect the consistency/feel of the meal. Just finished this for dinner. DELICIOUS. I made this last night and it was amazingly delicious! My husband raved about it! So far this was my second meal made with the inspiralizer (got it for my birthday a week ago) and both recipes left us feeling blown away at how easy it is to make gourmet healthy tasty beautiful meals! Thank you for your recipes and your courage to quit your job and start this!! I'm so happy to hear it! Thank you so much!! 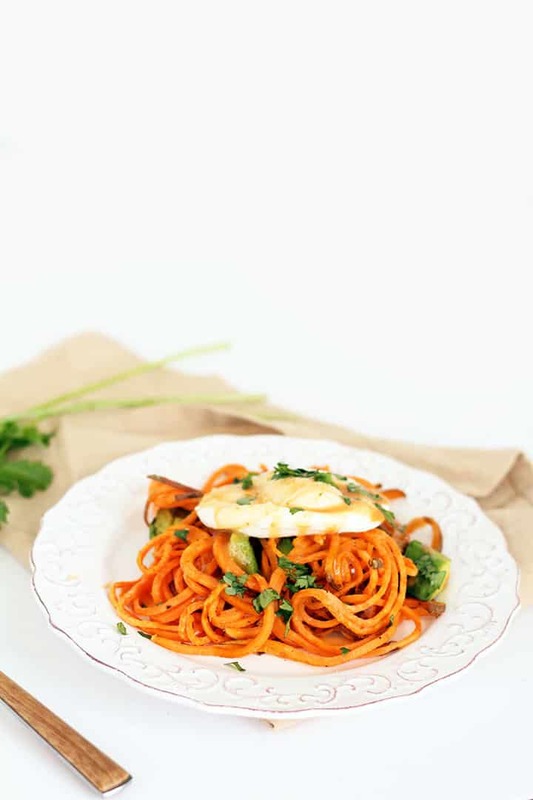 Glad to hear you're loving spiralizing!